The Regional Growth Fund (RGF) has awarded Lotus £10.44 million, which will be used for research and development of products, along with staff training. 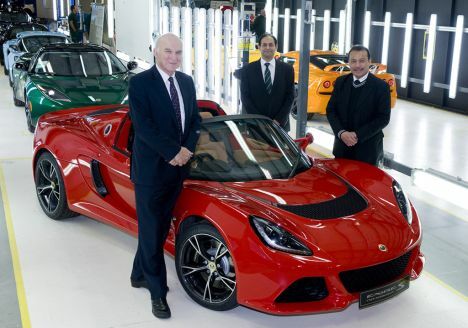 In addition Lotus is expected to create 313 new full time jobs to support production over the coming years. Business Secretary, Vince Cable MP (pictured on left) visited Lotus’ Norfolk headquarters today, 25 November 2013, where he toured the engineering and factory facilities and formally announced the grant to Lotus management. Aslam Farikullah (pictured centre), Chief Operating Officer at Lotus, said: “This grant is part of a wider strategy for Lotus created to ensure we thrive and grow. We are responding to increased global demand for our cars and engineering consultancy services and this grant will help to position Lotus at the forefront of global automotive innovation.